Animal Farm is a classic tale, with a chilling warning of what follows corruption and greed. It is full of memorable quotes, characters to either pity, hate or cry for. It will leave you both sobered and scared. 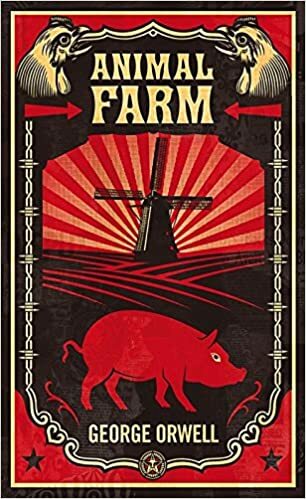 Animal Farm is a story of terrifying, brutal dictatorships, heroic but hopeless characters and bitter endings. I recommend this book to anyone interested in stories in dystopias, animals and twisted dictatorships. On Manor Farm, animals are neglected and overworked, slaves to humans. Old Major, an influential pig, encourages them to rebel and reminds them that 'all animals are equal'. A revolution begins, and the animals drive the humans from the farm. Happy with their newfound peace and freedom, the animals celebrate. However, Napoleon and his group of pigs quietly seize control. They write their laws with paint on a wall. Eventually, their rule becomes vicious, as Napoleon executes any animal even possibly against his regime. The animals live in fear. Napoleon overworks them, just like the people did, giving the things they grow and create to humans for alcohol. Boxer, a hardworking horse who contributed the most to Napoleon's society, collapses one day from overwork. Napoleon sends him to a knacker, lying to the animals and saying that he will go to a veterinarian. Eventually, the animals begin to starve, while the pigs are full of food and wine. The animals ask why they get more food, when all animals are supposed to be equal. The pigs write 'all animals are equal, but some are more equal than others'. Napoleon holds an indoors dinner party with the pigs and invites humans. Looking through the windows, the other animals realise that they can no longer tell the difference between the two. Sources: Image from Amazon, Animal Farm written by George Orwell and first published by Secker and Warberg.